Yes I have a passion for the Australian Gouldian Finch, it has been my life’s interest that has lasted sixty years, with the experience gained over the years it did enable us to establish the Australian Yellow Gouldian Finch mutation. And the experience we gained from that has simplified the more difficult mutations we are working on at present!!! Hello my name is Don Crawford. And yes this is a site to promote the Australian Gouldian and my other passion the Fallow Hooded Parrot mutation which I am also credited with establishing. Hope you enjoy what we have to offer. My journey with the Gouldian is a long one. It all started back in the early fifties with some wild caught birds, bought from a dealer. Wild birds were very common in Sydney in those early days. Surprisingly, these birds were very hardy in the cold Sydney winters. They were also great breeders. In fact I did so well with them I decided to invest in the not-so-common Orange Head Gouldian. I was lucky and purchased a cheap pair for five pounds. My single type aviary was typical for those early days, a very open construction with only the back third being enclosed for some protection from the wet weather. The wild birds were quite tough and only slept in the open flight, although they did breed in the enclosed area in the darkest spots. Success with these birds was very quick and trouble free, the reason I believe is because they were disease free and handled the stress quite well. They were also tiny birds compared to what we breed today, much more active, carrying a more intense vivid colour. In 1975 we moved from Sydney to the Northern Rivers. After relocating and building a suitable bank of aviaries, we were once again breeding gouldians. Now we fast forward to 1981 breeding season and out pops a new mutation in the gouldian known as the “Australian Yellow” being of recessive genetics and proving to be a very strong mutation, as they are to this day. But the mutations did not finish there. A local breeder who was retiring sold me his unusual coloured birds. The birds turned out to be a recessive Australian Dilute, but very different from the already established Australian Dilute, which Mr Ray Murray of Victoria had been working with for many years. His birds had a clear fawn back, where as mine had a fawn back masked with a green tint. So after comparing the two birds together it was very clear we had two different coloured birds of the same mutation produced in two different states. We learned so much from establishing these new mutations, that today we do things very differently to when we started in the fifties. 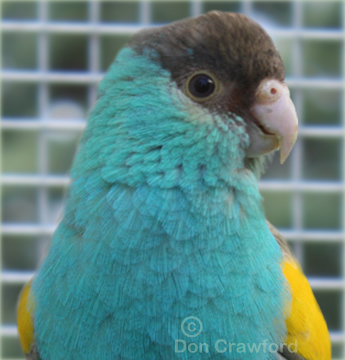 The knowledge we gained has taken the difficulties out of breeding, the current mutations we are working on at present, being the Turquoise Blue and the Lime Gouldian (both recessive). We also breed a pure strain of normal Gouldians to improve the vigor of our mutations, keeping our birds to the correct standard for quality young. We do frown at the use of Bengalese fostering because of the on-going hidden problems. Our birds are also antibiotic free and live a natural healthy life, created by a simple smart program.